Samsung refuses to accept its new flagships, the Galaxy S9 and S9+ may not sell better than the previous models and announced its promotion centers in South Korea were visited by more than 1.6 million people in just five days. Obviously, the reason these people came to Samsung's promotion studios is to test out the new Galaxy S9/S9+. As a matter fact, visitors were offered the chance to create their own emojis, one of the main features that Samsung marketed since the Galaxy S9's announcement. Samsung has Galaxy Studios across Barcelona, Spain, where consumers can come and take the new Galaxy S9 and S9+ for a spin. The South Korean company has already kicked off pre-orders for its flagship smartphones, which will be released on March 16 in major markets and gradually expand to other regions. Industry watchers claim Galaxy S9 pre-orders in South Korea fall short of Samsung' expectations, but we'll probably have access to a more accurate assessment in the coming months. I know company will use any data available to them to convince people to buy their products and other stuff. But still this stunt seems kinda desperate move from Samsung. Like I said before. I will never listen to anything that come out of the company's mouth wether it's Apple or Samsung. Better off let the consumers speak themself. Samsung did really shoot themself in the foot this year by trying to be like the boring company for not changing the design. Beautiful phone but who wanna buy something that already look the same as last year. Camera got better in low light but over all I like the Pixel2 camera better imo. Well Note 9 better be different Sammy boy. LG, Sony, Nokia hurry bring something out will ya. It's your chance. That's ridiculous. It is neither economical nor smart for a company to drastically change the design of their product every year. No company with a good brand identity does that. Get real. Had a hands-on of the S9 & S9+ models yesterday. First impression is that it just looks like an S8/S8+ if not for the huge product material display with the S9/S9+ name on it. Not many changes to the interface compared to an S8. But one thing I noticed was how lightweight the phone is, to the point that it feels like cheap plastic instead of glass and metal. It just doesn't feel like a premium phone despite the price tag. The camera feels promising, but comparatively its only slightly better than the already-great cameras from S8/S8+ and my Note 8. The Slow-mo effect can also be easily overlooked. Price-wise, its at least $200 more expensive than the S8/S8+. At this point I don't think there's much for anyone with an S8/S8+ to hop on the S9 bandwagon. All I can say is, wait for the Note 9 instead. Yea, comparing photos on phone display is th best way to do it, you got a point, its a slight upgrade. Lightweight? The phones are heavier than their predecessors which weren't lightweight to begin with. I have to disagree with you on that one. No. It's less than a credit card wider & two hundredths of an inch thicker. Those are negligible increases. Don't feed into the ignorance. 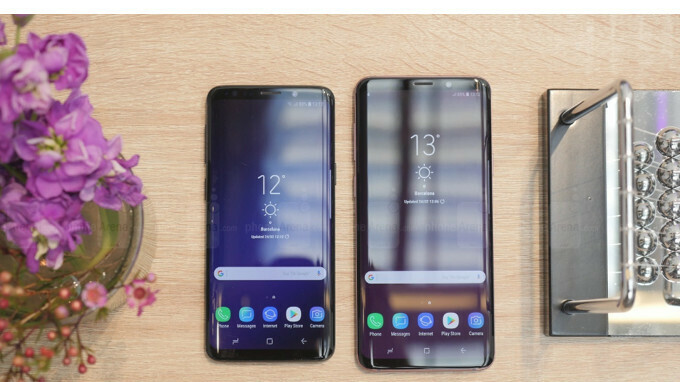 If you look relatively, S9 is 6.25% thicker than the S8. And try to be nice, no one owes you nothing. And I would call negligible considering the overall size. Also, I like how you conveniently left out the fact that it's less than 1% wider. Besides, I was being nice & while your double negative betrays you, I already realize no one owes me anything. I don't see what that has to do with anything though. "Don't feed into the ignorance." This is the nicest sentence ever written, yeah for sure. I am allowed to put my perspective, ain't I? You're the one who took it negatively. I never said it was "the nicest sentence ever written". I said I was being nice which, from my perspective, I was. You're allowed to say whatever you want. That should be obvious. This is the internet. Welcome. How does the glass and metal on it feel like cheap plastic when it's the same type of GG5 and metal frame used on all smartphones, INCLUDING the S8 that you just said they felt the same while holding. What you didn't know is that the S9 is even heavier than the S8. You lost all the credibility in your comment by this sentence alone. Then comes the camera, reviewers have had the phone for a week now and a small number of them did a brief camera reviews because it's still running on pre-production software, yet you were able to give us a conclusion about the camera after trying a store demo unit? He needs to do some homework before he speaks. Lighter than the s8, thats funny because it is heavier, lol. pre-production and retail unit won't differ by huge margins. heck i doubt it will be any different. at this point, flagship cameras are all great, some have cons and pros on their own, no camera is "the best" on all aspects. Where at? I haven't been to my local Best Buy yet. Being a Note user, as far as S models go, I just look at what's new on that & look forward to what will be bigger & better on the Note that comes out in the fall. Interesting that you say it feels lighter than its predecessor. "...one thing I noticed was how lightweight the phone is, to the point that it feels like cheap plastic instead of glass and metal." Not sure what kind of demo you had but at Best Buy the S9+ felt heavier than the S8+ & both the S8 & S9 feel light to me. Not cheap, just light. Yeah, they visited, then they realized that the S9 is grossly overpriced and brings nothing new worthy of the new price. Then they left. It costs the exact same as the S8. If it costs more in your country, blame your government for increasing customs duty/your currency depreciating in value. I tested an s9+ at a mall yesterday. It was ok, but really felt boring. The camera was spectacular, they even had dummy objects that move fast for you to test the slow motion camera. The phone is really solid but I just wasn't impressed overall. If you're wanting to find a wow factor in a phone,this isn't it and the price tag is ridiculous. To a point I agree, it's not a huge update for people with a s8/s8+. A lot of upgrades will be come from people with phones older then the s8 and s8+, so for them it will be a big update. Emoji stuff on Samsung is a bit questionable. Works with Apple since they have majority of children playing on social media, but don't know about Samsung. The only thing don’t like about S9/S9 plus armoji other than both phones are better than S8 and S8 plus especially Samsung made it more wider and easy to hold unlike tall S8 plus.